The company, headquartered in Rio de Janeiro, signed a distributorship agreement with Pointwise in 2012. It provides CFD consulting, custom development, and technical support and training services using OpenFOAM®. Wikki Brasil is the first company to offer OpenFOAM services in Brazil. Wikki Brasil was founded in 2012 by Antonio Samel and Prof. Guilherme Cunha, managers, and Prof. Paulo Lage and Prof. Luiz Fernando, associate professors and researchers at Federal University of Rio de Janeiro. A pioneer in its market, Wikki Brasil's partners have 10 years' experience in CFD. Prof. Cunha, whose expertise is renewable energy and combustion, is part of the Combustion and Reactive Flows Group at the Brazilian National Institute for Space Research, where he is a professor for master's and doctoral candidates and coordinates and collaborates with research and development projects. Mr. Samel has worked with Petrobras in multiphase and multicomponent flows and conducts research and development in that field. Wikki Brasil staff also has expertise in the development of algorithms for optimization and control of industrial processes and participates in research and development in areas such as fluid structure interaction and compressible flows. The company's goal is to offer a complete suite of leading edge customizable CFD solutions using OpenFOAM. Especially benefitting from customization are engineers and researchers working with the challenges incurred with the development of large, newly discovered oil fields in Brazil. 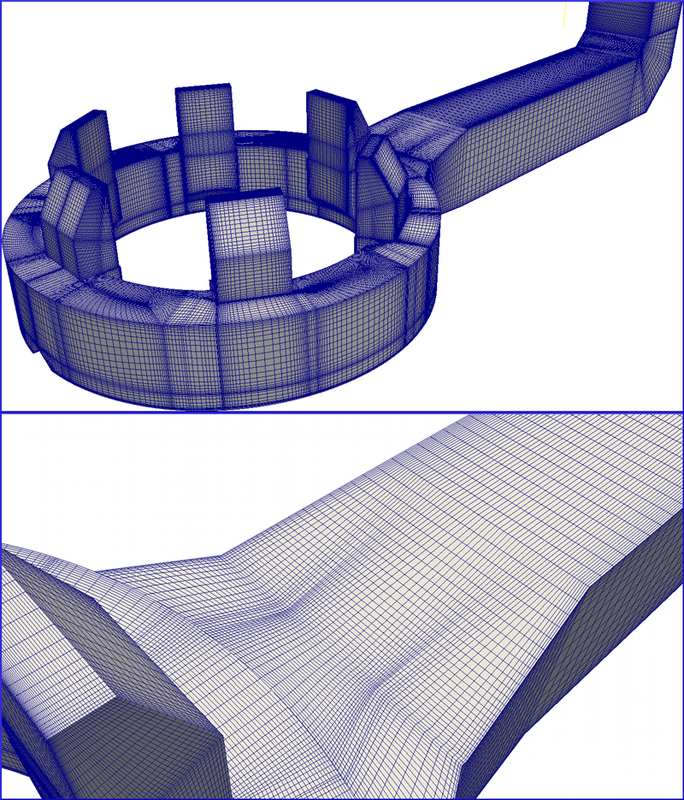 “Pointwise's meshing algorithms respond to our needs in terms of high-quality meshes, the construction of which is scriptable and intuitive via a user-friendly GUI. Additionally, Pointwise's plugin API allows us to write our own grid exporter, ensuring full compatibility between Pointwise and in-house codes,” said Prof. Cunha. Hexahedral mesh grid generated for a hydro-generator cooling exhaust system simulation by Daniel Bruno Silva using Pointwise and OpenFOAM. Images are courtesy of Hidroenergia Ldta. of Brazil.